Belching, bloating, and gas can strike at the worst possible moment and are extremely embarrassing, to say the least. The good thing is that you can solve your gastric troubles by resorting to the realm of natural home remedies for gas. It is always a good idea to try natural ways for gas relief instead of taking antibiotics to overcome the problem. We've outlined some of the very best and effective home remedies for gas problem that will definitely help make living easier for you. Why it helps: The combination of lemon and baking soda will help produce carbon dioxide that aids with digestion. It is one of the very best home remedies for gas and its effects will kick in within 20 minutes of using it. How to apply: You need to take half glass of water and add a teaspoon of baking soda in it. Now, squeeze a lemon in the mixture and stir thoroughly. Add more water to the solution once you notice the "fizz" is no longer there. You can combine this solution with apple cider vinegar to help increase your body's pH level that will improve your health and alleviate gas problems. Why it helps: Peppermint contains menthol, which has an antispasmodic effect on your digestive tract, and even helps soothe nerves. Therefore, it's one of the best home remedies for gas pain and churning stomachs. How to apply: Place the tea bag in a mug and pour boiling hot water over it. Now, cover it up for a while and take the cover off in 15 minutes or so. Squeeze the teabag again before taking it out. Drink it slowly for gas relief. Why it helps: Chamomile has anti-inflammatory, antispasmodic, and relaxing properties and works amazingly well to relieve gas pain and heartburn. 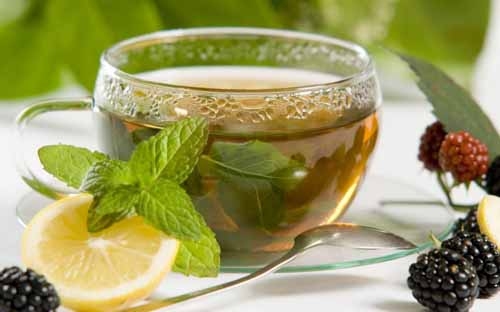 How to apply: Just how you prepare peppermint tea, you can prepare a chamomile tea in the same way. You just have to use a chamomile teabag instead of a peppermint teabag. You may add a bit of lemon and honey in the end to make it taste better. How it helps: Black pepper is one of the best home remedies for gas because it is lauded for its impressive healing abilities. It works great to heal acidity and indigestion by releasing hydrochloric acid in your stomach. How to apply: Take ginger powder, black pepper, dried mint leaves, and coriander seeds in equal quantity and grind them all to make a mixture. Take a teaspoon twice a day to cure gastric irritation. How it helps: Using apple cider vinegar will make your stomach acidic enough to digest food and relieve both gas and indigestion. How to apply: You can take apple cider vinegar with water and honey or make a solution by mixing a teaspoon of honey and a tablespoon of apple cider vinegar in a cup of water. Drink this solution thrice a day for good effects. How it helps: Garlic utilizes its pungent heating quality and works wonders to stimulate your gastric system. How to apply: You can have a bowl of soup with garlic used as an ingredient. You can also consider boiling ground garlic in water. Just boil it for a few minutes only and add some cumin seeds and black pepper as well. Strain it and drink when cooled off. How it works: Carom seeds can cure indigestion and are one of the oldest home remedies for gas as well. In fact, you can use the herb to deal with any stomach problem whatsoever. They work by improving the release of gut juices. How to apply: The simplest way to use this remedy is to consume 5-10 carom seeds a day. You may take it with a pinch of salt and a glass of water taken afterwards to find immediate relief. How it helps: You will have to use water to make other remedies work, but warm water can help cure gas problems on its very own. Drinking warm water is one fine way of ridding your body of all the toxins that may be overloading your digestive system. How to apply: Just drink plenty of water a day, especially in the morning and after meals. Make sure to drink warm water only – neither cold nor too hot. Using ginger will help prevent gas from forming inside your stomach. To keep flatulence away, you may consider chewing on a piece of ginger. It is also a good idea to add ginger to your food. A ginger tea will also help. You can prepare it by grinding up small ginger pieces and adding them to a cup of hot boiling water. Leave it there for 10 minutes and heat it up once again before drinking. Take slow sips and drink at least thrice a day for good effects. You need to pay attention to your diet to ensure you don't have to face the embarrassing gas and bloating problems. It is important that you cut back on caffeine-laden beverages, fatty fried foods, sugary sweets, and the like to keep your digestive system healthy. Be sure to limit or avoid these triggers along with avoiding foods like broccoli and beans because their high fiber content sometimes upsets your stomach.